Chris Losito is currently a 3L at Washington and Lee. Originally from Darien, Connecticut, he received his undergraduate degree from Franklin & Marshall College. At W&L, Chris is a Lead Articles Editor for the Washington and Lee Law Review, as well as a Hearing Advisor. After graduation he will be working for Norton Rose Fulbright US LLP in New York, NY. as a litigation associate in the Financial Institutions group. I visited the Office of Career Strategy numerous times, which helped me find resources to aid my research of different law firms in New York. 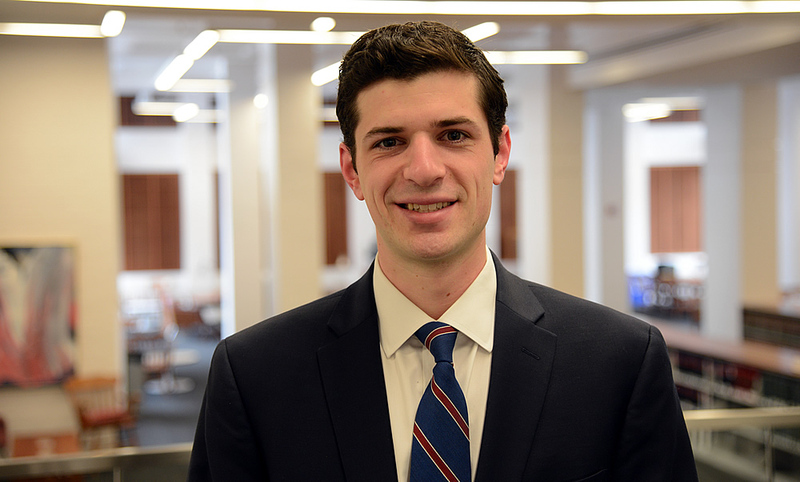 From there, I used the tools they provided to find firms that I thought would fit and cross-referenced those with firms at which I knew I could have connections, either personally or through the Washington and Lee alumni network. Norton Rose came up on my research, and I had a personal connection in their London office. From there, I applied online. After sending in my application, I reached out to my connection and he courteously notified the recruiting department of my application. Fortunately, the recruiting department offered me the chance to interview. I jumped at the opportunity, and a few days later received a call offering me a position in Norton Rose’s 2017 Summer Associate Class. After spending an incredibly fun and informative summer at Norton Rose, I was offered a full-time position as an associate, which I accepted. What classes or experiences were useful in preparing you for your job? I think the most useful classes or experiences were those that helped me develop my legal research and writing skills. Thus, the first-year small sections and writing classes were incredibly helpful. Those classes required me to communicate my ideas effectively, allowing me to prepare the core skills necessary to function as a first-year associate. During my second year, I fulfilled the writing requirement by working on a student Note for the Law Review. This experience was invaluable to me, as I continued honing my research skills. It required me to leverage a number of different sources and assemble them into one cogent piece of writing. What aspects of your work are you most looking forward to? I am most looking forward to working with the bright and driven people at Norton Rose. Additionally, Norton Rose merged with Chadbourne & Parke LLP while I was there this past summer, but the two firms were not yet completely integrated. So, I am very excited to return to the combined firm and continue making new connections. Moreover, I am looking forward to continue learning about the law, and putting the skills I learned while at Washington and Lee into practice. The core skills, researching, writing, and communicating are all things I look forward to developing, and I could not ask for a better place with better people than Norton Rose to resume honing those abilities. Which professor(s) from law school has been the most helpful in preparing you for your next professional step? I think every professor at Washington and Lee helped prepare me for my next professional step. Although, my first year writing professor, Professor David Millon, was incredibly helpful in first introducing me to craft of legal writing. Professor Millon acted as a mentor throughout my first year. He was always available for questions, and gave me advice about applying to jobs, even when I did not have a class with him. The first year of law school can be daunting, so it was incredible to find a professor who was always willing to help me. Professor Millon has since retired, but his passion for teaching and helping students exists with every Washington and Lee professor. What advice would you have for prospective students interested in a similar career path to you? Leverage all your connections effectively, do well in school, persevere throughout the application process, and go the Office of Career Strategy. When it comes to finding a job in Big Law, nothing substitutes for hard work through the entire process, which begins the first day you walk into class. I would also recommend doing good research into firms on the front end. The more you know about the different firms, and what makes each unique, the easier it will be to move forward throughout the process with a clear goal in mind. Look back on your time at W&L Law, do you have a favorite memory or experience to share? One of my favorite memories of my time at Washington and Lee came at the beginning of my second semester. Grades from the first semester had just been posted, and I wanted to speak with one of my professors about how I could improve. Professor Buchhandler-Raphael met with me and took me through my exam. Importantly, Professor Buchhandler-Raphael could see I was clearly disappointed with myself, and she took extra time to reassure me. I left that meeting confident and ready for the semester ahead. This memory has stuck with me because I remember being so surprised that a professor would take the time to encourage me. I am certain that many other students have had similar conversations with many other professors here at Washington and Lee. That is part of what makes this place special.